Following up a really awesome idea is tough. Say, for example, that you went to high school with noted serial killer Jeffrey Dahmer, and later turned that life experience into an award-winning graphic novel (My Friend Dahmer, still available), you might find it difficult to get a follow-up that would have as much impact. The fact that you worked on a garbage truck for a while when a young man, might, perhaps, have some possibilities for fictionalization, but it's not going to have the pop of "yeah, my high school buddy ended up killing and eating several people, can you believe it?" None of that is John Backderf's fault -- in fact, he had one compelling story handed to him by life and treated it brilliantly -- but it's the kind of thing that can lead to oddly uncomfortable conversations with one's publisher. ("So, Mr. Derf...do you know any other serial killers for your follow-up?") But it all does lead into Trashed, which is a more conventional graphic novel, and one that doesn't have the newsworthy hook of Backderf's last. 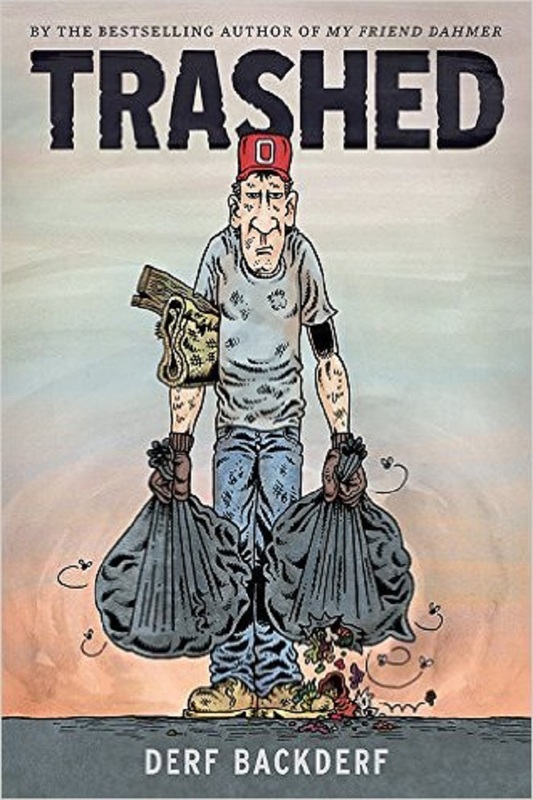 Trashed is not Derf's story; it is fiction, and focuses on a young man named J.B.  in the present day, in a smallish town somewhere full of blue-collar white people. (Like Backderf's own garbage-picking career, this is somewhere in Ohio.) Young J.B. starts out at the bottom of the trash-collection totem pole in this town -- giving Backderf an opportunity to showcase some carefully observed understanding of the hierarchies of small-town, semi-political organizations. But J.B. rises somewhat in the ranks over the course of the next year, mostly by being reasonably competent in doing his job and surviving when others flake out or quit around him. The book is organized around the four seasons, which all are horrible for the trash-collection men for various different reasons, and Backderf lovingly gets into the muck and mire of this job. 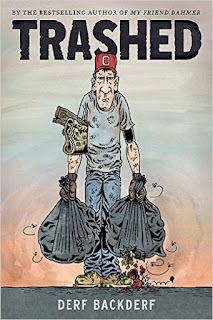 Trashed is one book that everyone can be very happy is not available in scratch-and-sniff form. Along the way, Backderf explains the American way of disposal, which is deeply flawed: done cheaply and half-assed, with toxic leakage almost guaranteed, even with "modern" landfills with their fancy plastic linings and gas-venting systems. This book may make you seriously check out how close landfills are to your home (or water source) and the most likely directions of any leaks -- or turn you into a zealot for reducing packaging, but I'd bet the former more often. The fictional story is fairly thin: it's all around the trash crew, both their mild interpersonal conflicts and the slightly more serious issues with their town-level overlords. It all comes out OK in the end, not due to anything we actually see on the page or that J.B. does -- Backderf might say that this is realistic, and how workplace conflicts usually end. That's true, but it's not a great argument for making choices for a fictional work. But, if you don't mind a thin Horatio Alger garbageman story wrapped around the stinking fish of your lesson on modern garbage handling, Trashed gets the job done. Yes, those initials are very similar to the author's. One presumes this is deliberate.